Convolutional neural networks (convnets) have made possible a number of breakthroughs in image classification, and remote sensing (RS) is not an exception. However, in order to successfully apply convnets to a new task it should be trained on a large set of labeled samples. Acquisition of a large number of manually labeled RS images requires highly trained analysts, which makes it a very expensive task. 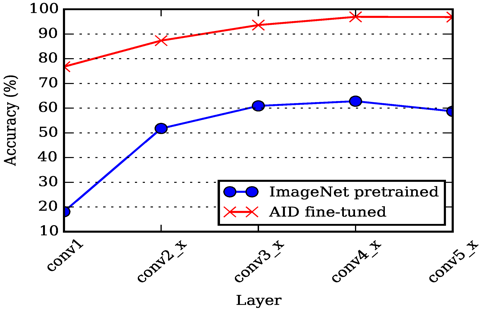 Nevertheless, convnets can still be applied to RS image classification by virtue of convnet fine-tuning. At the university of Banja Luka the use of pre-trained and fine-tuned convnets for classification of high resolution RS images is investigated. Researchers implemented an experimental framework for testing different convnet topologies and used it to evaluate convnets and analyze the quality of the features extracted from various layers of the network from the standpoint of classification accuracy. Publicly available datasets of RS images were used for the experiments. Due to high computational complexity of training convnets, researchers increasingly rely on graphics-processing units (GPUs). At the University of Banja Luka initial experiments run on a single NVIDIA Titan X GPU. Through the VI-SEEM project access was obtained to Debrecen2-GPU (LEO) cluster with 68 nodes containing NVIDIA K20x and 16 nodes containing NVIDIA K40x GPUs. Being a part of VI-SEEM project enabled performing development and experiments at a much brisker pace by utilizing the project infrastructure and existing know-how in issue solving. The performed experiments show that the network fine-tuned using RS images is able to produce features useful for classification of remote sensing images from different datasets in spite of variations in sensors, resolution and imaging conditions. The obtained classification accuracies on UCM dataset using ResNet for feature extraction and linear SVM for classification. Command-line tool for high-resolution remote sensing image classification is available in code repository under the MIT License. The experimental results have been reported in two conference papers. Vladimir Risojević, “Analysis of Learned Features for Remote Sensing Image Classification”, NEUREL 2016, Belgrade, Serbia, pp. 151-156, November 2016. Ratko Pilipovic and Vladimir Risojevic, “Evaluation of Convnets for Large-Scale Scene Classification From High-Resolution Remote Sensing Images”, IEEE EUROCON 2017, Ohrid, Macedonia, July 2017.